The government of the state of Lagos–Nigeria’s commercial capital–has proudly proclaimed it is building a new city that will become the new financial centre of Nigeria, and perhaps West Africa. The scale of the Eko Atlantic project is immense and progress is being achieved through a team effort between investors, planners, engineers and contractors. Attract and retain top multinational corporations. There is no shortage of doubters and critics of the initiative, which is seen as an exercise in runaway neoliberalism by a country that cannot even ensure 30 days of continuous power supply to its citizens. The truth, however, is that Lagos deserves its dream Eldorado and the economic case for Eko Atlantic is sound. The only problem is that the plans are in fact not radical enough. Our argument is that this project is under-imagined and should be shored up urgently to match other international projects in the fast-developing countries. In particular, we believe a city should be created along the lines of Paul Romer’s charter city. These are cities in which the governing system is defined by the city rather than by state, provincial, regional or national laws. This would mean that Eko Atlantic city would operate under high standards of transparency and good governance. Its security would be handled by independent policing standards. This could extend to other aspects of its civil and criminal justice systems. Its sanitary, health, energy supplies, environment and other regulatory rules should be pegged with comparable standards in London, New York, Paris, Dubai and Shanghai. This would ensure that the laws under which the territory operates are, in essence, free of stifling national regulation which has stood in the way of most African cities operating at optimal levels. At the moment, all aspects of the planning and building of the Eko Atlantic city are squarely in the hands of the private sector involving both local and foreign venture capitalists. Those already on board include local and international banks – First Bank, FCMB, Access Bank Plc. and GT Bank in Nigeria, BNP Paribas Fortis and KBC Bank – as well as a growing number of private investors. The recent inauguration of a new governor for Lagos, West Africa’s mega-city with close to 18 million residents, presents a further opportunity to rejig plans and boldly move towards chartered city status. Rather than just becoming a financial venture, the Eko Atlantic experiment can be carried further at no extra cost to become the hub to transform good governance in Nigeria and West Africa. Already Lagos is the gold standard for other parts of the Nigerian federation. In 2012, it generated annual revenue of about US$1 billion, dwarfing that of the other 35 federating parts of Nigeria. If Eko Atlantic city is competently handled by world experts in the legal economic and industrial fields, returns to Lagos economy can easily double. Bad systems and rules are the reason most African cities do not attract much-needed international investment at appropriate levels. Bad rules have tied down the development of Lagos along with 1000 other African cities since their independence from colonialism. These include corruption, mismanagement, political interference, unresponsiveness, overbearing religiosity, nepotism, human rights abuses and incompetent presence of the state. Presently, the judiciary, health and administrative systems of most Nigerian cities have severe problems. Lagos is no different even though it is still far ahead of the other 34 states and federal capital territories. 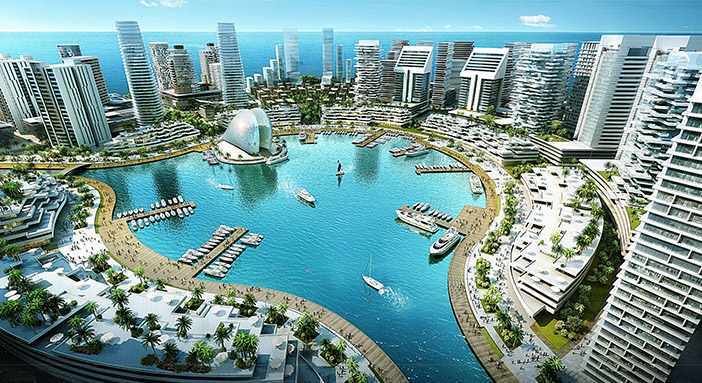 Eko Atlantic ought, therefore, to provide a petri dish to run a very new kind of African city. Lagos will have to work with the federal government to be able to create a special zone of reform. The arrangements will require further delegation of control to Lagos state, which will in turn give up powers to the regulatory authorities of the chartered Eko Atlantic city. Such arrangements and concessions should be easier now as the constellations have aligned for the first time in Nigerian history. The Lagos state is now run by the same government and party that rule the country. This arrangement will allow Lagos to make more credible promises to investors across the world. There will be a mutual benefit of exchange in favour of investors, employers, residents, the state and the country. In a depressed international economy, such a city would attract the qualified, the brave and the adventurous from the entire globe. African countries sorely need a skilled workforce from the developed world to fill hi-tech employment and service industries that will fuel growth in the 21st century. There are successful comparable projects across the developing world. The Chinese government, seeing the tremendous success that different rules made of Hong Kong, wisely created special zones offering tax and tariff incentives. There is the phenomenon of medical cities that are scattered in many regions of Saudi Arabia. Dubai is a beacon of success and Abu Dhabi is already closely following these examples with its bold creation of the Abu Dhabi Global Market established on Al Maryah Island. This is the latest United Arab Emirate creation of a financial free zone based on a separate jurisdiction. Honduras is also currently involved in the creation of such high-quality, liveable cities. It is certain that the proposed changes will generate controversy. Nationalist feelings against this proposal may run high. But this problem is not insurmountable. The current governor of Lagos, Akinwunmi Ambode, will do himself and nearly everyone a great deal of good if he gets himself a similar plaque to remind him of the golden opportunity the Eko Atlantic City represents in his hands. By: Gbenga Oduntan, Senior Lecturer in International Commercial Law at University of Kent.